A few months ago I was auditing the 2ch servers. 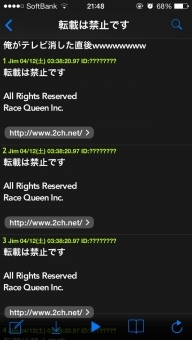 I found a server that was letting l.ogsoku download data directly from 2ch. As soon as I found that, I removed that server. Now l.ogsoku has to crawl the website directly. They do not have the firehose access anymore. Yes. That is why u.nkar is closed now. L.ogsoku is owned by a big corporation, so it will take a lot more to shut them down. SC is owned by a millionaire with nothing better to do, so it will take a lot more to shut them down too. L.ogsoku has MANY more resources than SC. L.ogsoku has a full-time staff and many IP addresses. SC crawler is just one person using a residential IP. When I find his IP then I ban it. After I ban his IP, then he goes to the next computer cafe and restarts the crawler. Logsoku - I will be seeking legal action. *.2chblog individual user mostly ok. Although LINE owns that domain and would need to pay. Yes, quotes are almost always ok as long as the source is properly noted. I am still making some final changes to the new anti-crawl system. I plan to start enabling the anti-crawl system on Monday night. Maybe I will need to tweak the settings constantly this week to find the most optimal result. 222 ：ひろゆき＠どうやら管理人 ★：2014/07/07(月) 05:52:54.03 ID:??? 398 ：ひろゆき＠どうやら管理人 ★：2014/04/12(土) 04:38:49.79 ID:?? ?